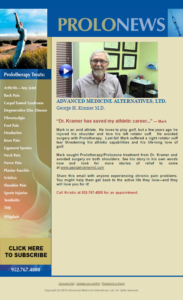 ProloNews Newsletter – March 2016 | George Kramer, M.D. Barb was suffering from severe pain that involved her back, hip and radiated down to her knee. After only a few months of Prolotherapy / Prolozone treatments she is now pain free.